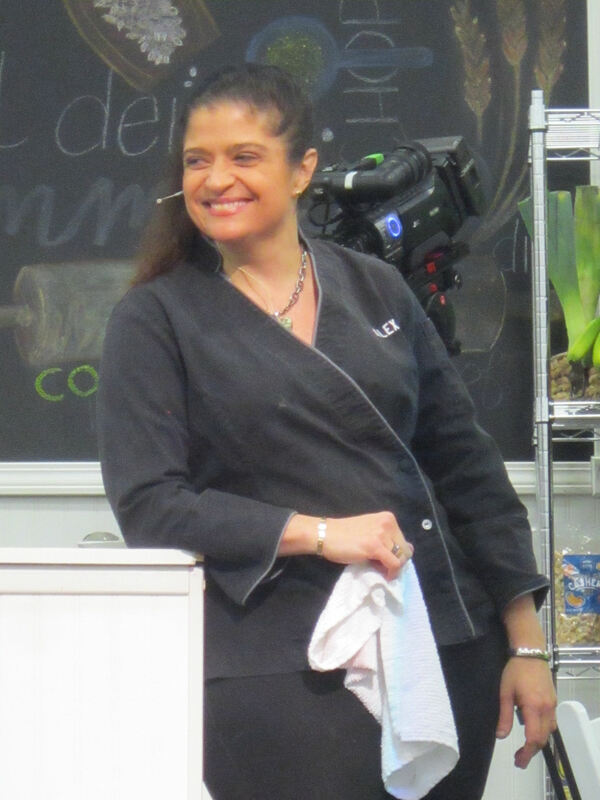 Cooking with Alex Guarnaschelli at Indy’s 2nd Fantastic Food Fest « Midlife Crisis Crossover! 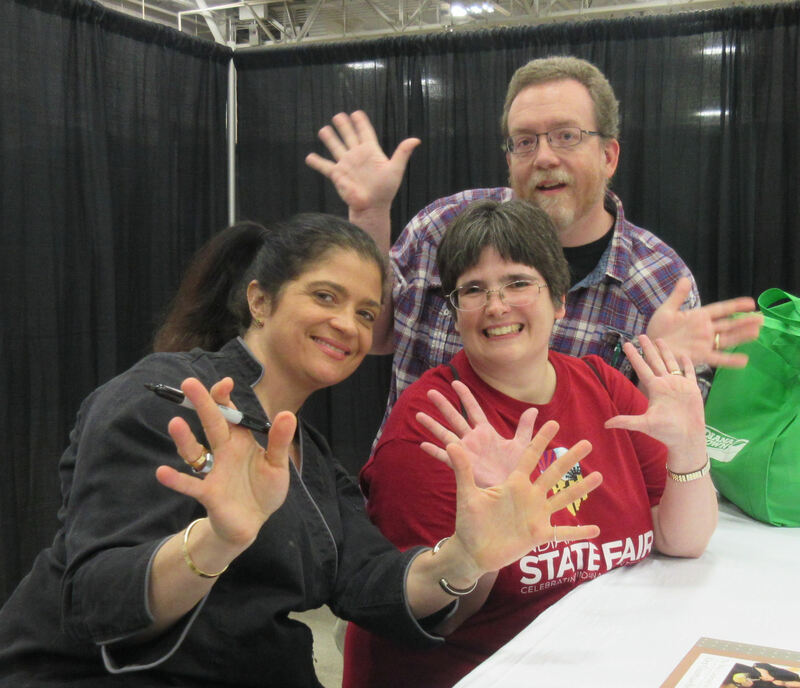 True story: Chef Alex is the first person we’ve ever met at a show who mentioned jazz hands in a Q&A before we even had the chance to ask. Last year my wife Anne and I had the pleasure of attending the inaugural Fantastic Food Fest at the Indiana State Fairgrounds, planned by its creators at Circle City Expos as an annual event bringing together the best and brightest providers from numerous restaurants, markets, farms, caterers, bakeries, and other tremendous sources of locally sourced ingredients and cuisine under one roof for foodies to gather and escape winter doldrums. Year One’s big show brought in a headliner we loved to meet, Chopped host and hometown hero Ted Allen. If the show was successful, we figured we’d return regardless of the guest list. Dozens of participating entities shared 75,000 square feet of culinary harmony to ply their wares, exhibit their inventions, pony up oodles of free samples, inspire creative ventures, conduct cooking demos, teach cooking classes (baking, gumbo, fresh pasta, kids’ cooking, etc. ), and more more more. Fine cheeses from Traders Point Creamery. 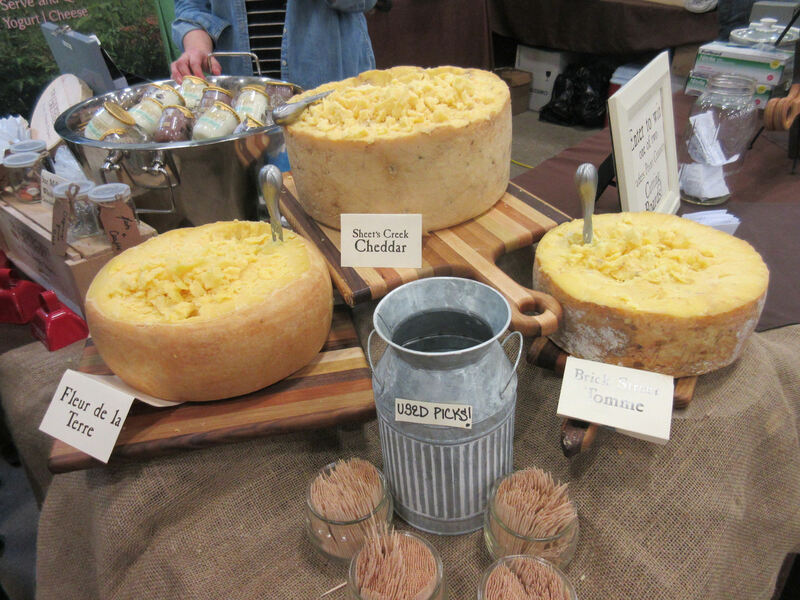 The Sheet’s Creek Cheddar was our clear winner. 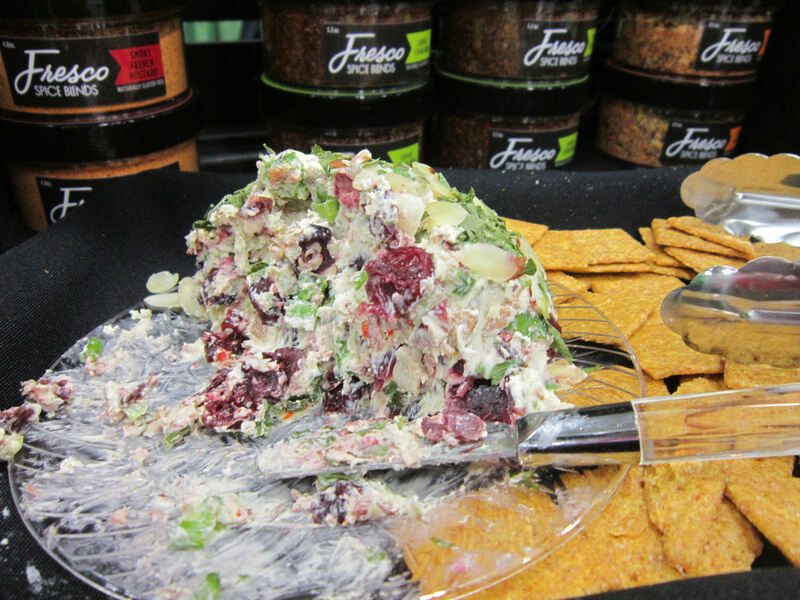 A spicy cranberry spread by Fort Wayne’s Fresco Spice Blends. 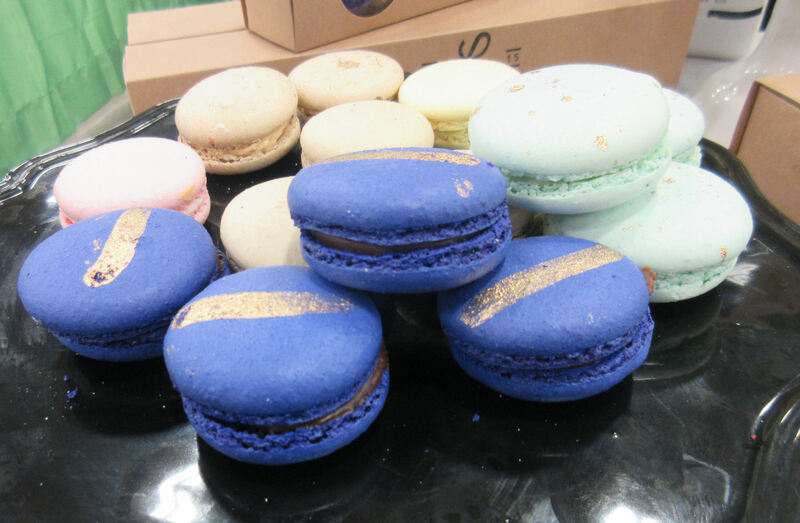 Super light macaroons courtesy of The Gallery Pastry Shop. 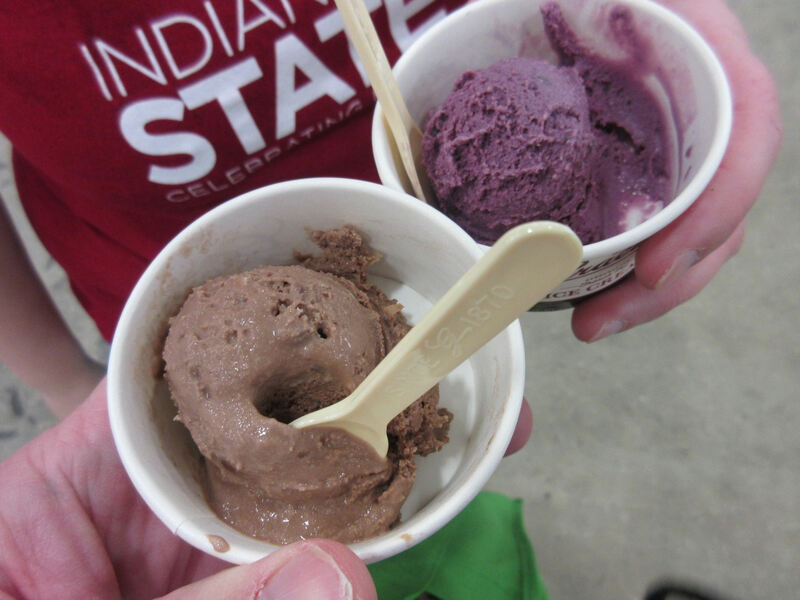 Our old friends at Graeter’s Ice Cream brought chocolate coconut almond and black raspberry chocolate chip. …and those were just the freebies I wrote down. 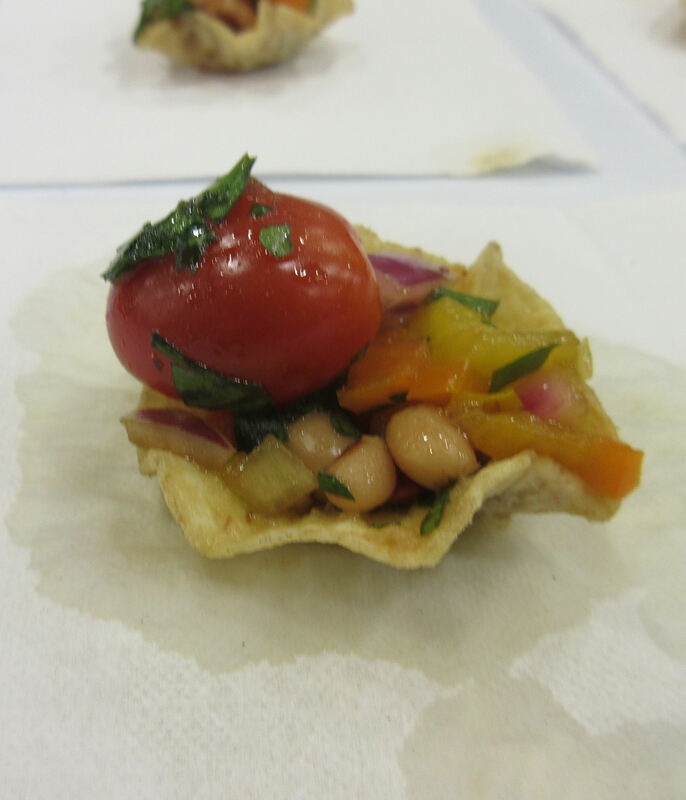 Once again their Tasting Pavilion brought in several restaurants and caterers selling sampler portions of their respective menus’ regular offerings for a low price that encouraged experimentation from potential new customers. 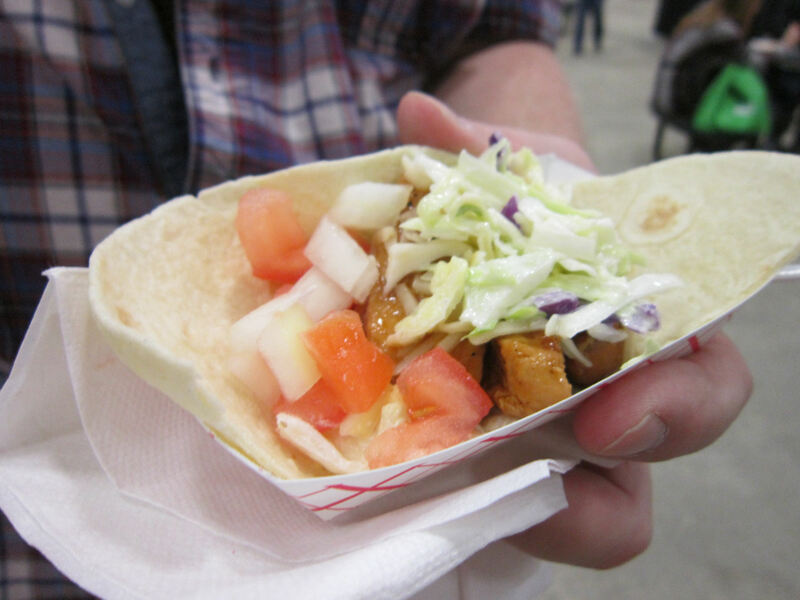 A chicken teriyaki taco from the Chomp’z food truck. 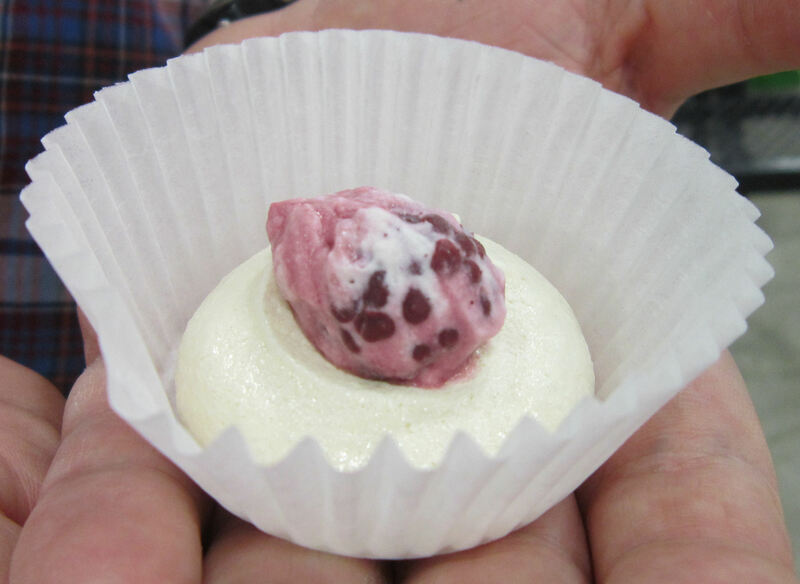 A mini-pavlova with blackberry creme, from The Juniper Spoon. 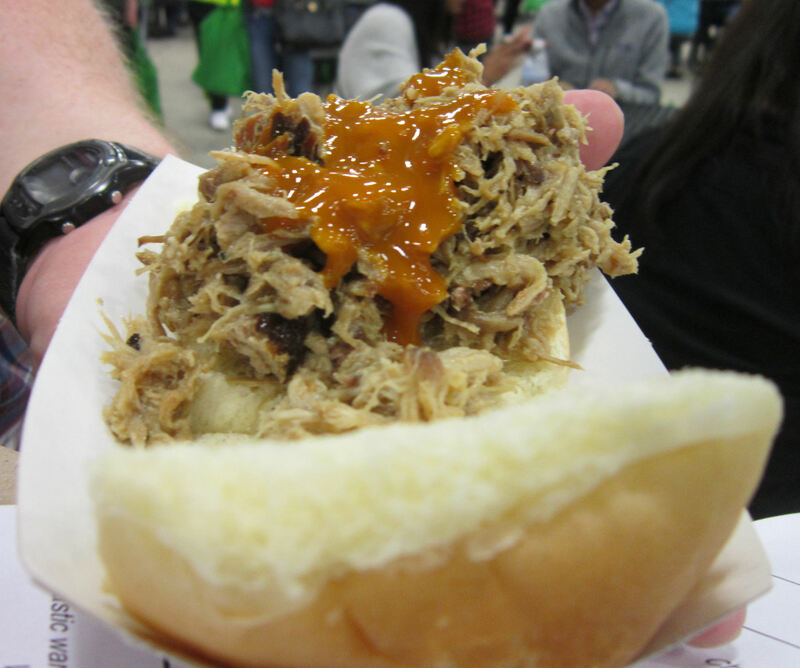 A food truck called Big Poppa’s Pork Pit brought in pulled pork sliders with their own mustard barbecue sauce. 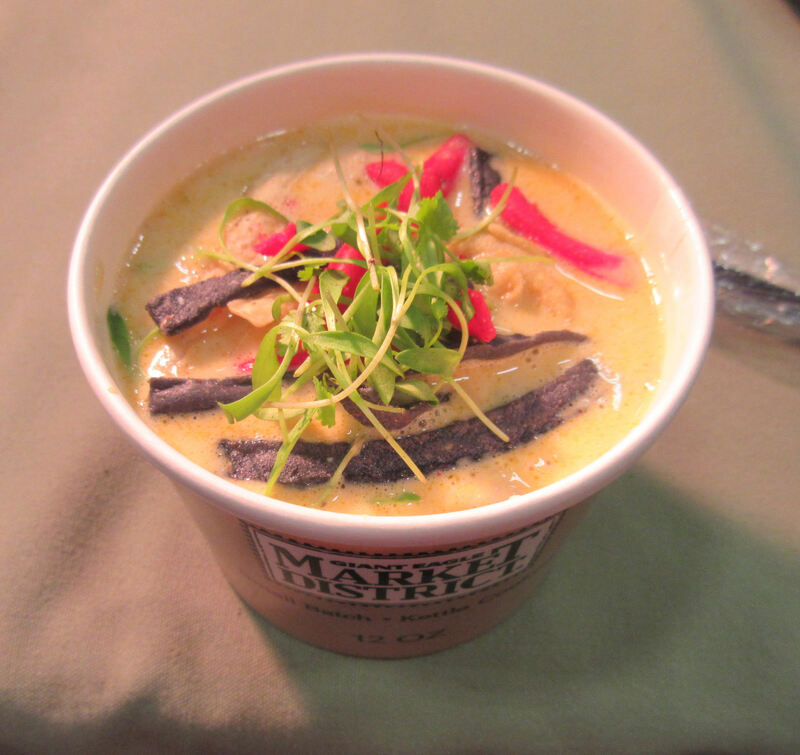 Corn chowder from Table at Carmel’s Market District. 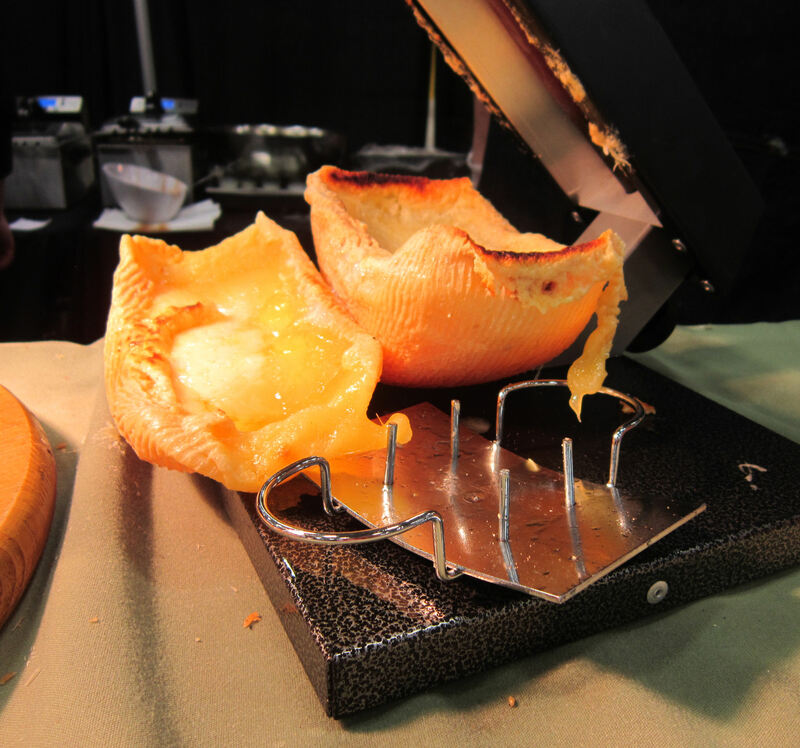 …spooned out of this block of cheese hollowed out into a bowl. 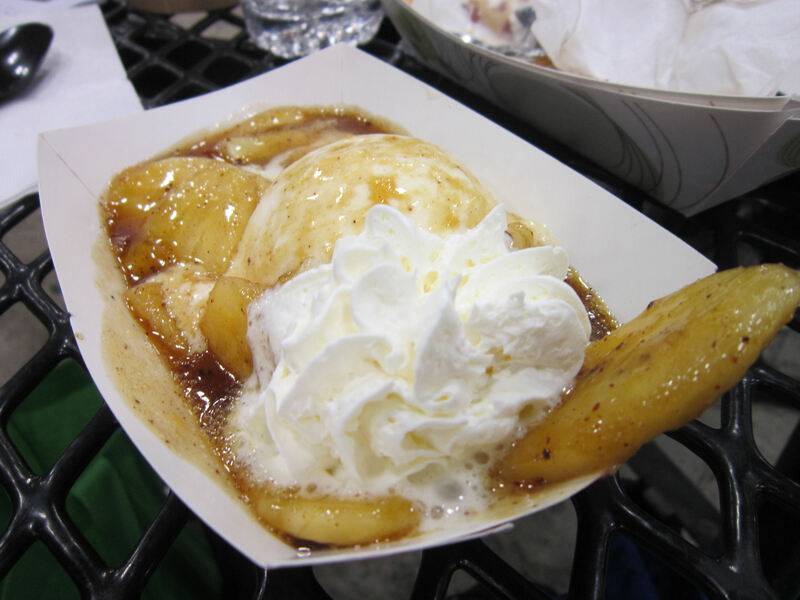 Bananas Foster from The Ville, a Noblesville eatery with a New Orleans-trained chef who cooked the bananas in a skillet with banana liqueur to order while you watched. 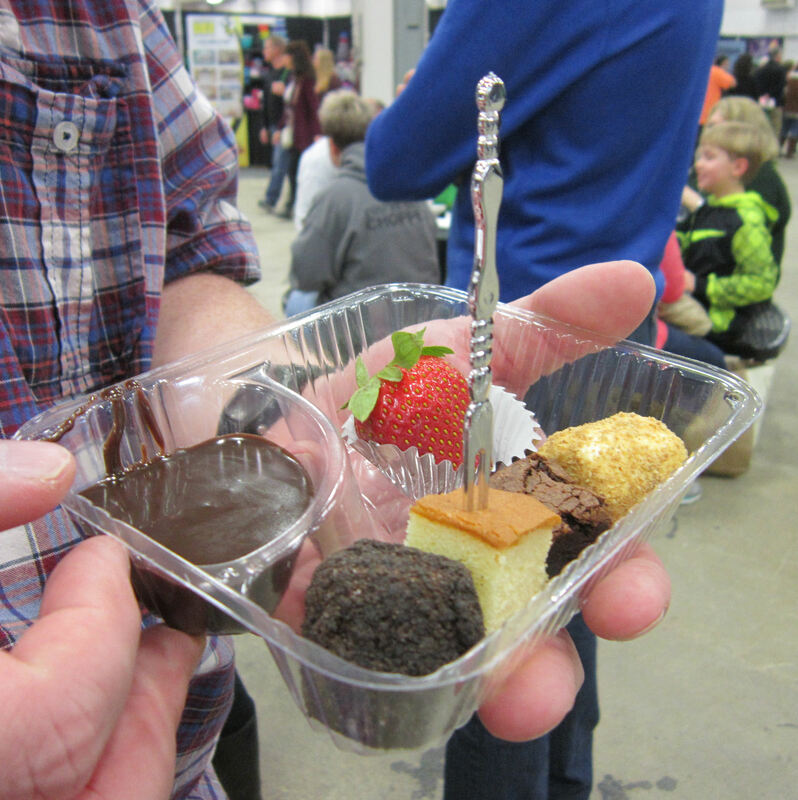 Later in the afternoon, a fondue sampler from The Melting Pot hit the spot. 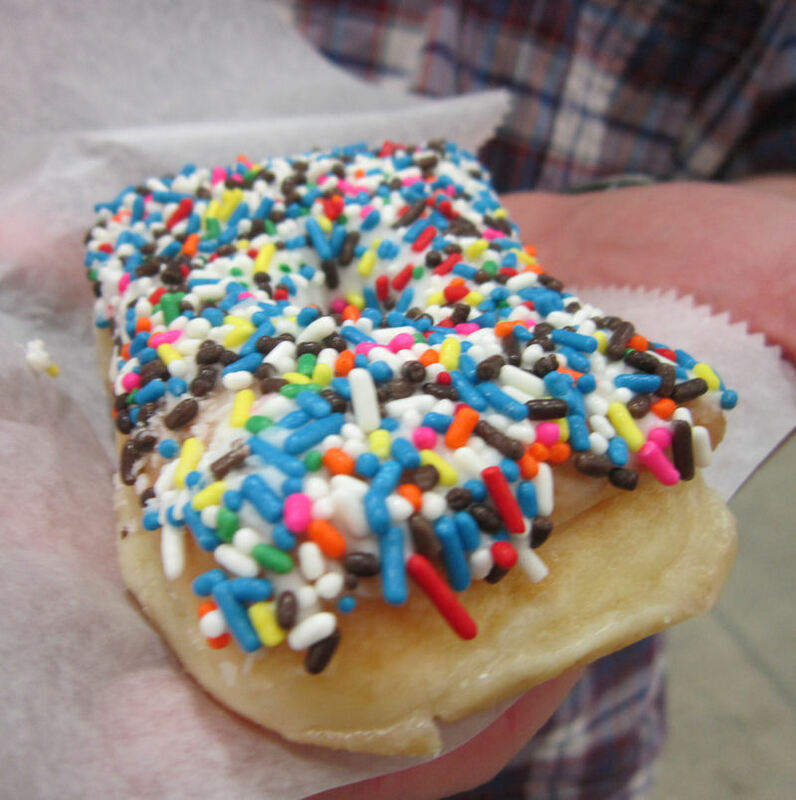 Last palate cleanser before we left was a simple sprinkle-coated treat from Square Donuts. Not pictured because it came out blurry: a short but delightful shrimp corn dog in mustard-seed/honey sauce from Oakleys Bistro. 12/10 would pay extra for a foot-long version. 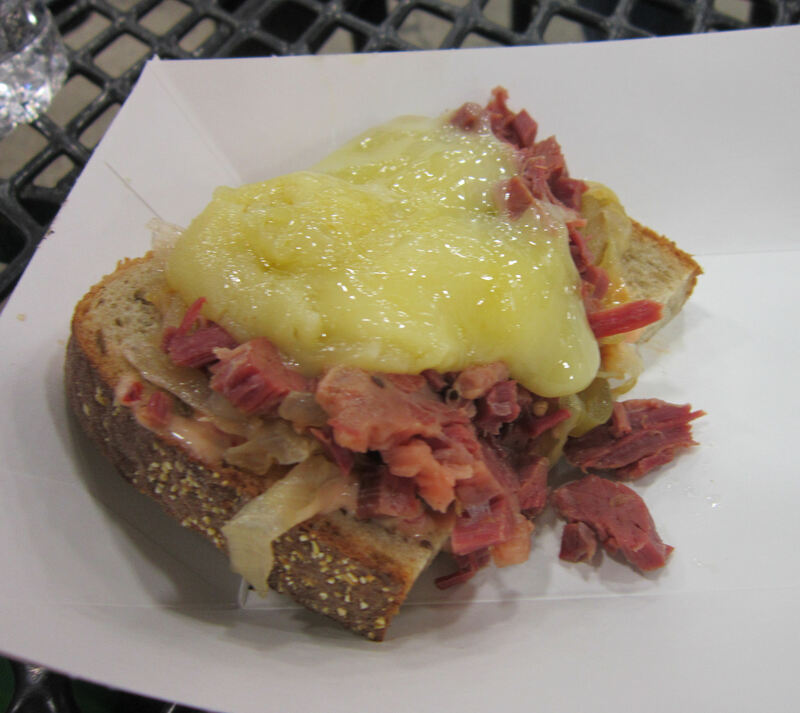 The way our scheduling went, we regrettably missed the cooking classes, but would love the chance to try one sometime. 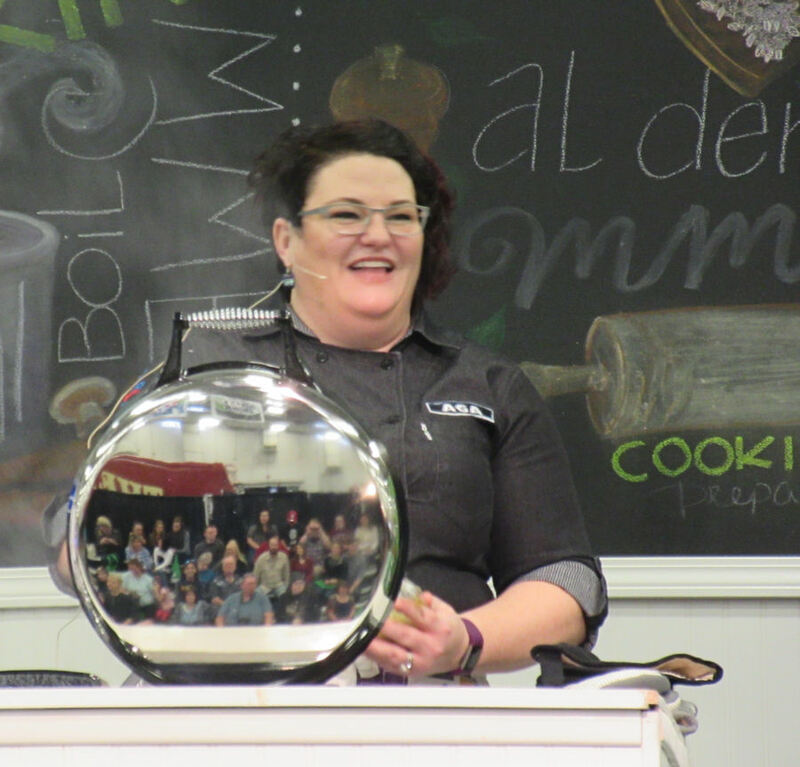 We caught part of a demo by Chef Susanne Grier, a culinary instructor at Ivy Tech Community College, who in forty-five minutes made a frittata, grilled zucchini, and baked cookies while showing off cookware and appliances from one of the show’s sponsors. Fun puzzle for the kids at home: can you tell which fuzzy image in that cookware’s reflective lid is me? 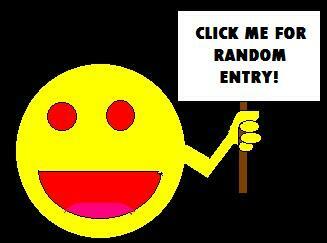 Because I actually can. Infinite bonus points if you can also spot Anne, who’s mostly obstructed behind a tall guy. 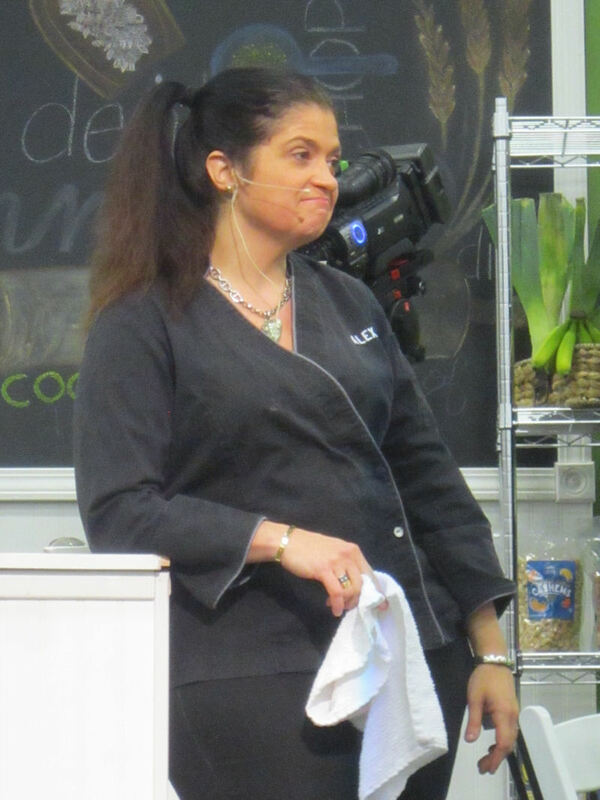 After Ms. Grier was, she acknowledged with a smile, the one we were all waiting for: TV’s Chef Alex Guarnaschelli, costar of Chopped, the greatest Food Network series of all time in our household. Chef Alex began as an art history major in college who didn’t discover her passion till she turned 21 and graduated. From there she waded into the world of finest cooking, living for several years in France, and learning the skills from a variety of chefs, some of whom weren’t likeable but who in retrospect imparted valuable lessons nonetheless. 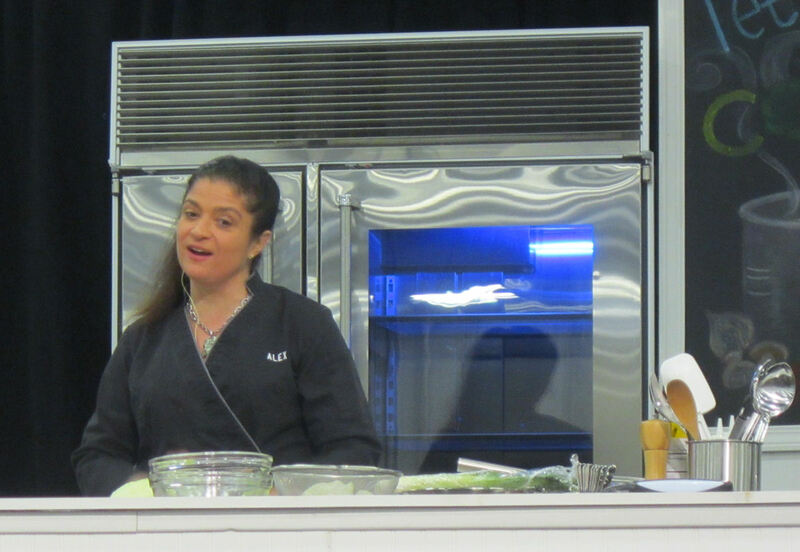 She counts Bobby Flay, Julia Child, cookbook author Marcella Hazan, and early seasons of Iron Chef among her influences. For her demo she came up with an iceberg wedge salad topped with bleu cheese crumbles and a creamy garlic dressing beyond the mere cheese itself, followed by grilled salmon seasoned with lime juice and curry-spiced almonds, served with a side of yogurt sauce containing dill and cumin. 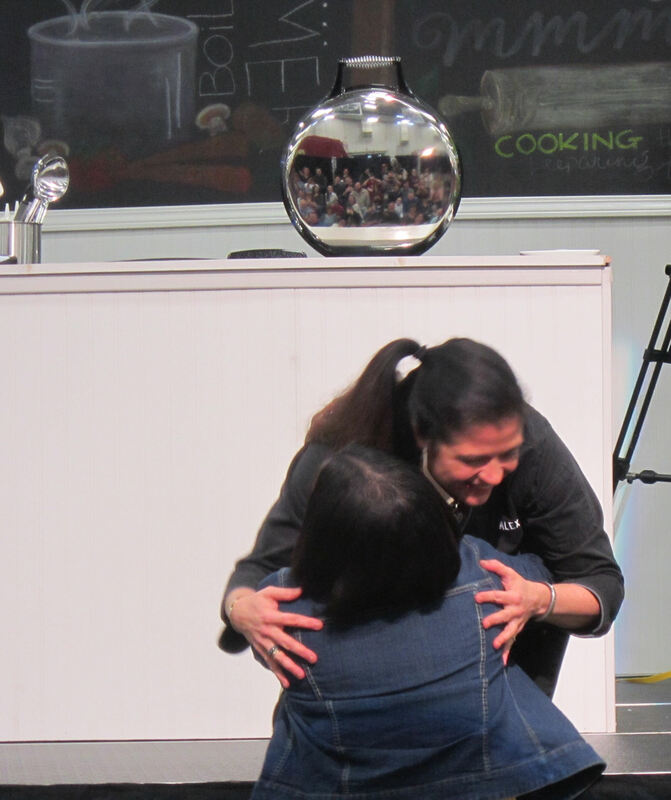 A quartet of fans sat at a table onstage to enjoy the results, having earned the perk as a thank-you for their donations to local charity Second Helpings. 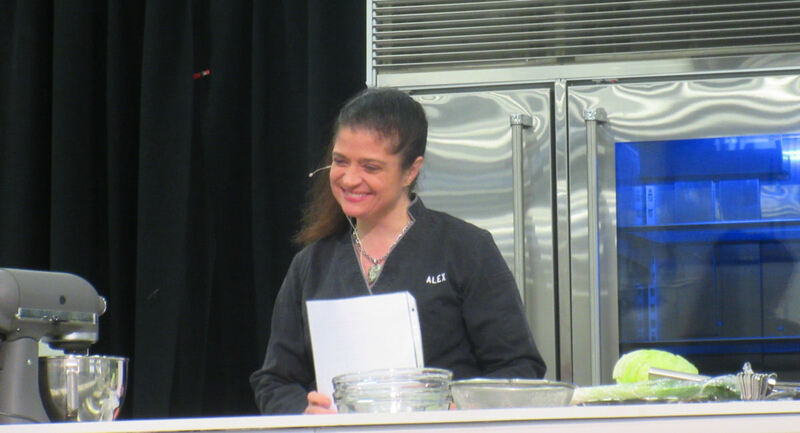 While she worked and grilled and mixed and assembled and so forth, Chef Alex took questions from the audience on a variety of topics. Things got off to a fun start when a fan asked her about recommendations on salad prep for germaphobes. She recommended buying pre-wrapped heads of iceberg lettuce, using garbage bags as gloves, forgetting the notion of actually washing each individual leaf, and never allowing anyone else to prepare her salads for her ever again. After an extended answer that was partly tongue-in-cheek but also partly serious, she offered a conciliatory hug. Second chance to spot us in the reflection again. This was after the tall guy moved, too. * Since her TV job sees a lot of variety and exotica crossing her plates, at home she’s content with plain comfort foods such as basic toast or hunks of meat just salted, peppered, and cooked. * Leeks are wildly underrated. * It’s fun doing her TV job and her executive-chef job, only to come home to a 9-year-old daughter who’s also watching Mom on TV and who complains when Mom underseasons dinner. * She’d love to judge a Chopped episode in which the contestants open their baskets, live game birds fly out, and the competition is on. * Favorite Chopped dish to date: a plate involving duck fat biscuits, grape leaves, and pickled ginger. Worst that’s aired to date: French toast topped with pureed hot dog. And she’s only spit out a contestant’s food once. So far. We didn’t have the opportunity to try any of Chef Alex’s dishes ourselves after she finished, which is just as well because by the time all was said and done, including our half-hour autograph wait (a cakewalk by our standards really), we were fatigued and stuffed and ready to depart. I’m sorry we missed her 4:30 demo, but I hope it at least help free up seats for the latecomers from the 1:30 session’s Standing Room Only crowd. But we didn’t come away empty-handed. Once again Fantastic Food Fest gave us a successful, enlightening, filling experience with a lot of takeaways to liven up our meals in the days ahead. Lord willing, we’ll be there again next year. 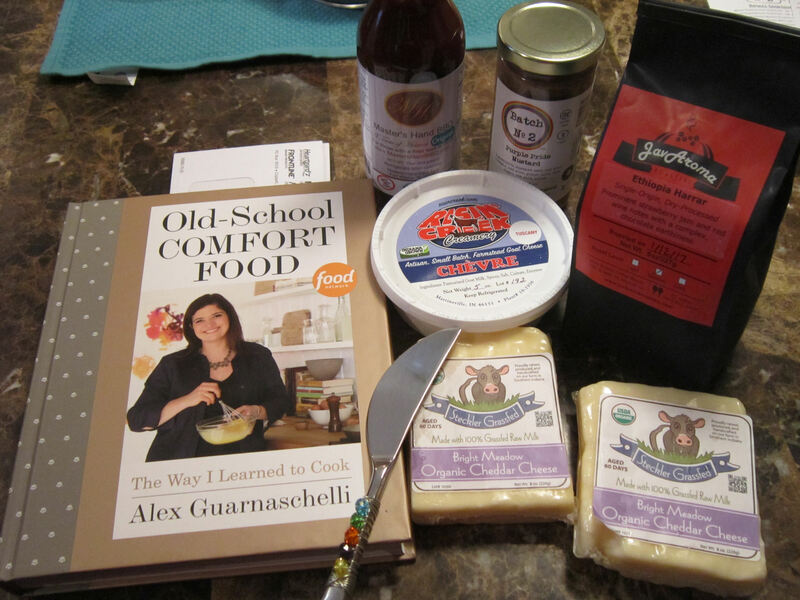 Our shopping stash included one non-food purchase besides the cookbook, a bejeweled server/spreader from Swiddles. That’ll come in handy for my future brownie batches and be the prettiest utensil at the pitch-in.